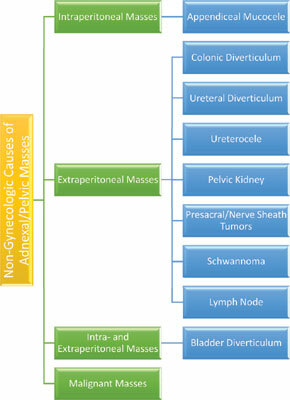 Pelvic masses can pose a diagnostic dilemma with a broad differential to include both gynecological and non-gynecologic etiologies. While the initial instinct may be to search for gynecologic causes for the female patient, non-gynecologic etiologies must be considered as well. The presentation can be similar amongst many different causes of pelvic masses and imaging is generally required for further assessment to determine if the mass is intra- or extraperitoneal. The etiology of adnexal masses covers several subspecialties: gynecology, urology, gastroenterology, neurology, and oncology. For this reason, it is important for all to be aware of the differential diagnosis for pelvic masses. Adnexal mass, non-gynecologic, non-ovarian, pelvic mass, pelvic metastases, diverticulum, nerve sheath tumors.